This is the French pocket paperback edition of Seldom Disappointed: A Memoir, published in 2006 by Rivages/noir in Paris, France as a pocket edition, which means the size of the book is smaller than regular editions. This book is an autobiography of Hillerman's life from his childhood in Oklahoma to his career on the Bestseller's Lists. The text was translated into French by Danièle and Pierre Bondil. 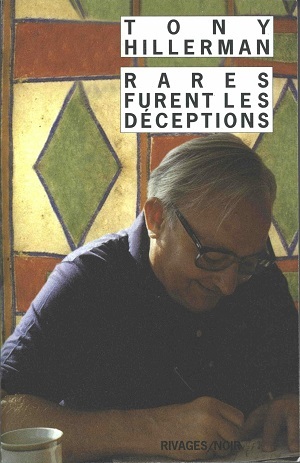 The cover features a photograph of Tony Hillerman by Pierre Bondil. Binding: Paper covers with full color photograph. The author's name, title, and publisher are printed vertically on the spine.